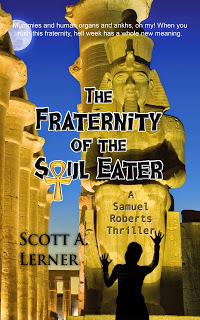 Today we're excited to share an interview with Scott A. Lerner as part of "The Fraternity of the Soul Eater - A Samuel Roberts Thriller - book 3" blog tour. I am an attorney and an author. I enjoy movies, good books and snacks. I have been told I am handsome by people who have consumed a great deal of alcohol. I also strive to be kind to pets and plants. Describe the plot of your new book, “The Fraternity of the Soul Eater,” in a few sentences. A fraternity on a large Midwestern campus is sacrificing co-eds to an Ancient Egyptian deity. Sam, a small town lawyer, and his friend Bob want to put an end to this evil practice. It turns out the sacrifices are just the start of a far more sinister plan. Anyone going to college for the first time would enjoy this book. It is certainly a must-read for anyone going to the University of Illinois. But any reader who loves a fun, fast-paced paranormal romp will like my book. My friends and relations might also like it. They will at least buy a copy due to social pressure. For people who haven’t read the first two books, tell us a bit about the protagonist, Samuel Roberts. Sam is sort of an average guy facing nightmarish situations. He is calm, smart, and willing to do what has to be done. Sam is extraordinarily in that he is willing to put his life on the line to save others, despite having no superpowers. Egyptian lore and genetic engineering are featured in the plot of this novel. Have you always been interested in these topics or is this an interest that developed recently? Yes, I love both topics. What I enjoy even more is the juxtaposition of the ancient with modern scientific techniques. In my day job I sometimes have to cross-examine witnesses as to genetic identification evidence. I do find it fascinating. I am also a little concerned about genetic manipulation in humans going forward into the future. How do you think fans of the first two books will respond to this one? I hope they will enjoy it. It should be a fun read. It is just a matter of finding the time to write. I enjoy doing it when I have the time. Sometimes I have to wait for an idea to come but once I get started it gets easier. It is hard to try and market a book. "The Wicca Witch of the Midwest" comes out around Halloween. Should be spooky fun. Yes, it is fast paced and fun and certainly worth a look. People can read my blog at http://scottlerner.camelpress.com/ they can find my books at Amazon, Barnes and Noble, The Camel Press web site or wherever fine books are sold. You can also like me on facebook https://www.facebook.com/scott.a.lerner. Enter a giveaway for "The Fraternity of the Soul Eater"